Organic rolled oats, organic tapioca syrup, organic brown rice syrup, organic dried coconut, organic almonds, organic rice crisps, organic cashews, organic chocolate chips (organic cane sugar, organic cocoa liquor, organic cocoa butter and organic vanilla), organic dates, organic coconut palm sugar, amazing grass green superfood (organic wheat grass, organic barley grass, organic alfalfa, organic spirulina, orgnaic spinach, organic broccoli, organic acai, organic maca, organic carrot, organic beet, raspberry, organic rose hips, pineapple, green tea, organic flax lignans, L. acidophilus, alpha and beta amylase, protease, lipase, lactose, cellulase, organic peppermint), organic cashew butter, organic chocolate flavor and organic vanilla extract. Allergy Information: Contains coconut, almonds and cashews. Made in a facility that processes peanuts, tree nuts, wheat, soy and milk. Contains minimally processed whole food ingredients, which therefore may include pit, stem or shell pieces. Organic Dark Chocolate Coating: Organic Evaporated Cane Juice, Organic Chocolate Liquor, Organic Cocoa Butter, Organic Soy Lecithin added as an emulsifier, Organic Vanilla. Organic Brown Rice Syrup, Organic Peanuts, Organic Peanut Butter (Organic Dry Roasted Peanuts), Organic Chocolate Chunks (Organic Cane Sugar, Organic Chocolate Liquor, Organic Cocoa Butter, Soy Lecithin, Organic Vanilla Extract), Organic Pumpkin Seeds (Organic Pumpkin Seed Kernels, Organic Sunflower Oil, Salt), Organic Almonds, Amazing Grass Green SuperFood (Organic Wheat Grass, Organic Barley Grass, Organic Alfalfa Grass, Organic Maca, Organic Spirulina, Organic Chlorella, Organic Raspberry Powder, Organic Spinach, Organic Broccoli, Organic Rose Hips, Organic Carrot, Organic Pineapple, Organic Peppermint, Organic Green Tea, Silicon Dioxide, Organic Acerola, Organic Flaxseed, Organic Acai, Organic Beet), Organic Cranberries (Organic Cranberries, Organic Sugar, Organic Sunflower Oil), Organic Sunflower Seeds, Organic Flax Lignans, Organic Brown Rice Crisps (Organic Brown Rice Flour), Organic Coconut Palm Sugar, Organic Natural Flavor, Organic Spirulina, Sea Salt, Cinnamon. Contains almonds, cashews and coconut. Processed on the same equipment as products that contain peanuts, treenuts, soy and milk. Contain minimally processed whole food ingredients, which therefore may include pit, stem or shell pieces. Organic dates, organic cashews, organic agave nectar, organic flax seed powder, organic almond butter, Amazing Grass Green SuperFood (organic wheat grass, organic barley grass, organic flax seed powder, organic alfalfa, organic rose hips, organic maca, organic spinach, organic pineapple, organic carrot, organic spirulina, organic chlorella, organic green tea, organic acerola cherry, organic peppermint, organic raspberry, organic broccoli, organic acai organic beet root), organic sunflower seeds, organic cranberries (organic cranberries, organic sugar, organic sunflower oil) organic almonds, organic pumpkin seeds, organic coconut, organic spirulina and organic vanilla flavor. Organic Almonds, Organic Brown Rice Syrup, Organic Peanuts, Organic Dark Chocolate Chips (Organic Sugar Cane, Organic Cocoa Liquor, Organic Cocoa Butter, Organic Vanilla), Organic Pumpkin Seeds (Organic Pumpkin Seeds, Organic Sunflower Oil, Salt), Organic raisins (Organic Thompson Raisins, Organic Sunflower Oil), Organic Cashews, Organic Tapioca Syrup, Organic Brown Rice Crisps (Organic Brown Rice Flour), Amazing Grass Green Superfood (Organic Wheat Grass, Organic Barley Grass, Organic Alfalfa Grass, Organic Maca, Organic Spirulina, Organic Chlorella, Organic raspberry Powder, Organic Spinach, Organic Broccoli, Organic Rose Hips, Organic Carrot, Organic Pineapple, Organic Peppermint, Organic Green Tea, Organic Silicon Dioxide, Organic Acerola, Organic Organic Flaxseed, Organic Acai, Organic Beet), Organic Peanut Butter, Organic Coconut Palm Sugar, Organic Vanilla Flavor, Organic Sea Salt, and Organic Flax Seed Powder. Allergy Information: Contains almonds, peanuts, cashews and coconut. Made in a facility that processes tree nuts, wheat, soy and milk. Contains minimally processed whole food ingredients, which therefore may include pit, stem or shell pieces. Organic almonds, organic peanuts, organic brown rice syrup, organic chocolate chips (organic cane sugar, organic cocoa liquor, organic cocoa butter and organic vanilla), organic pumpkin seeds, organic raisins, organic cashews, organic tapioca syrup, organic rice crisps, amazing grass green superfood (organic wheat grass, organic barley grass, organic alfalfa, organic spirulina, organic spinach, organic broccoli, organic acai, organic maca, organic carrot, organic beet, raspberry, organic rose hips, pineapple, green tea, organic flax lignans, L. acidophilus, alpha and beta amylase, protease, lipase, lactase, cellulase, organic peppermint), organic peanut butter, organic coconut palm sugar, organic vanilla extract and sea salt. 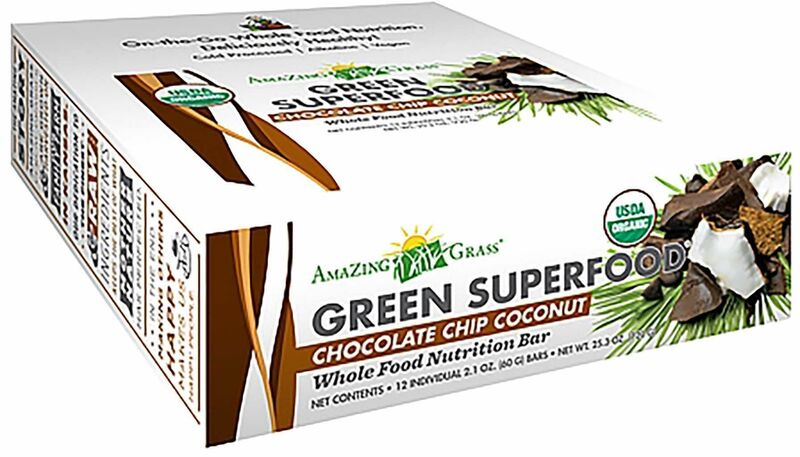 Indulge without the guilt...the Amazing Grass Chocolate Whole Food Nutrition Bar combines the nutrient-rich power of fruits and veggies with the delicious taste of chocolate, making it a Deliciously Healthy choice that you can feel good about. Do good by your body AND your taste buds! Contains Almonds, Cashews, Coconut and Soy. Processed on the same equipment as products that contain Peanuts, Tree Nuts, Soy and Milk. Contains minimally processed whole food ingredients, which therefore may include pit, stem or shell pieces. Organic Dates, Organic Almond Butter, Organic Agave Nectar, Organic Chocolate Chips (Organic Cane Sugar, Organic Chocolate Liquor, Organic Cocoa Butter, Organic Vanilla), Organic Cashews, Amazing Grass Green SuperFood (Organic Wheat Grass, Organic Barley Grass, Organic Alfalfa, Organic Spirulina, Organic Spinach, Organic Broccoli, Organic Acai, Organic Maca, Organic Carrot, Organic Beet, Raspberry, Organic Rose Hips, Pineapple, Green Tea, Organic Flax Lignans, L. Acidophilus, Alpha and Beta Amylase, Protease, Lipase, Lactase, Cellulase, Organic Peppermint), Organic Sunflower Seeds, Organic Flax Lignans, Organic Coconut Palm Sugar, Organic Almonds, Organic Coconut, Organic Cranberries (Organic Cranberries, Organic Sugar, Organic Sunflower Oil), Organic Cacao Nibs, Organic Pumpkin Seeds, Organic Chocolate, Flavor, Organic Spirulina, Organic Vanilla Extract. Organic Dark Chocolate Coating: OrganicCane Sugar, Organic Chocolate Liquor, Organic Cocoa Butter, Organic Soy Lecithin added as an emulsifier, Organic Vanilla.